The Nesco VS-05B includes 50 pre-cut quart size food sealer bags. 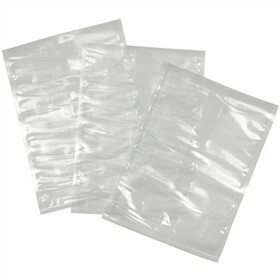 The bags are made using a patented material that locks in freshness and flavor by keeping air, moisture and odors out. The tear resistant material has a multi-layer construction with cross-venting channels on both sides that allow for maximum air extraction. The Nesco VS-05B has many exciting features for users of all types. You can extend the lifetime of your Nesco VS-05B with the purchase of a FactoryOutletStore Factory Protection Plan. The Nesco VS-05B is sold as a Brand New Unopened Item.